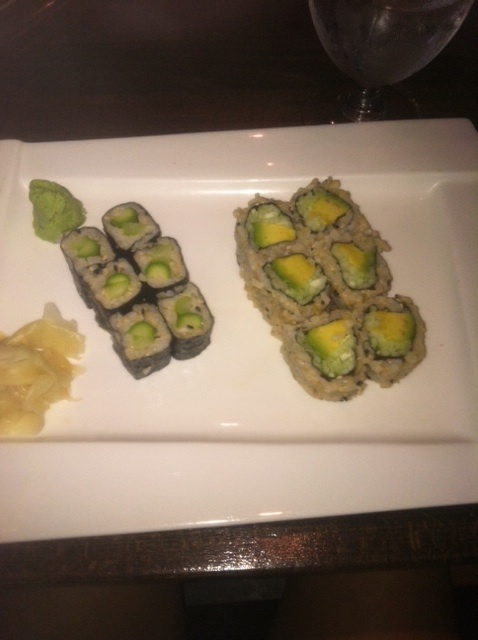 An avocado roll and an asparagus roll with brown rice from Ozu in Brooklyn Heights. This was only one part of my meal! I also had edamame, salad, and miso soup. Stuffed! I love going to Japanese restaurants. Not only do they tend to have cool and trendy environments, but they also have tons of options for people like me. Apart from that, however, they also have some hidden bad guys. Here’s how to eat properly when you’re feasting on Japanese cuisine. Sauces: Unfortunately, most sauces in Japanese dishes contain soy sauce, which not only has indigestible gluten, but also is usually packed in sodium. Avoid this! Whenever I go to a Japanese restaurant, I bring my own gluten-free, low sodium, tamari sauce. You can’t tell the difference. San-J even sells them in individual packets so you can discreetly carry them in your purse or pocket. You can find them at your local health food store or order them online at amazon. Farm-Raised Fish: Although I don’t eat fish, I recognize that there are some serious health benefits in doing so. However, if you’re eating farm-raised fish (especially salmon) you can kiss those benefits goodbye! Farm raised fish have tons of toxic additives and dyes. In addition, these methods are very detrimental to the underwater environment, as the additives that are fed to fish seep out into nearby waters. If you must consume fish, make sure to engage in a conversation with the chef and ask about farming practices. It’s very possible that there will be some wild options on the menu. Purse-Seined Fish: A large portion of fish are caught using the purse-seining method. Purse-seining is when two boats hold the sides of a large net in order to catch fish. The result is that the nets, although intended to capture only one type of fish, also catch several other sea creatures before discarding them. The amount of bycatch resulting from the use of this method is numerous and damaging to the underwater environment. So unless your fish is caught with troll or pole-and-line methods (again, don’t be afraid to ask the chef) it’s best to stay away. Vegetable Rolls: Japanese restaurants usually have a ton of vegetable roll selections, from sweet potato, to asparagus, cucumber, avocado, and pickles. Some even like to get creative with their rolls and put a bunch of vegetables in one. Order some of these and swap white rice for brown rice. If you happen to be at a restaurant that doesn’t offer the swap, you can always just get some rolls without rice at all. Three or four of these topped with gluten-free tamari sauce will leave you stuffed! Edamame: Although soy in the form of tofu, soymilk, soymeat, etc, is overly processed, filled with additives, and detrimental to your health, natural edamame is a great and complete source of vegetarian protein. Share an edamame appetizer and you’ll have a full day’s serving. Miso Soup: Minus the tofu, miso soup has tons of benefits, especially for vegetarians. The miso in miso soup has tons of b-vitamins, including b-12, which is difficult for vegans to get. It also serves as a good source of protein and amino acids. The wakame in the soup is high in vitamin A and copper, which helps your skin’s ability to regenerate cells and keep its elasticity. Make sure the soup is not made with fish broth if you are not a fish eater. Hope these tips help you for your trip to the Japanese restaurant! For more tips on how to make environmentally responsible decisions when eating fish, take a look at this chart from Monterey Bay Aquarium. Losing belly fat is the most common goal among those trying to lean down and improve their physique. Even if you maintain a great diet and you are exercising intensely several times a week, you still may have excess fat in the stomach area that you just can’t get rid of. One of the primary reasons you may be retaining excess fat in the stomach area is from long-term stress that results in chronically elevated cortisol levels. I reccomend ANDROGRAPHIS Pure 800 MG – Fast-Acting Strength, Healthy Immune Function, Physical Wellness for Seasonal Protection – Full-Spectrum & Standardized – 60 Vegetarian Soft Capsules if you are having issues with your cortisol levels. Please keep in mind however, that cortisol is not inherently bad. In fact it is essential for having energy, but too much cortisol, or cortisol being elevated when you should be sleeping, promotes fat storage in the belly and can lead to many other health issues like chronic fatigue and digestive disorders if left unchecked. You may think of stress as being mental or emotional, but keep in mind that physical stress and environmental stress are contributing factors as well. Training excessively without enough recovery and exposure to pollutants in the environment are examples of physical and environmental stress. Most of us who live in a hectic urban environment will not be able to avoid stress, so our best option is to manage stress as best as we can and to support ourselves nutritionally so that our bodies are better able to cope with stressful situations. Phosphatidylserine is a supplement that is known for its positive effects on mental function and brain health, but it can also be a powerful tool to aid in fat loss, especially in the belly area. Phosphatidylserine has been demonstrated to have a powerful effect on lowering cortisol. Because of this, it is best taken in the evening or after workouts. Many people who supplement with phosphatidylserine also report much improved sleep. Good sleep is vital for those seeking to lose belly fat because it is the sleeping hours when your body produces the most growth hormone which promotes muscle building and fat loss. About 300mg of phosphatidylserine in the evening is a good dose to start with. Magnesium is one of the most prevalent mineral deficiencies because modern agricultural practices deplete the soil of this mineral so that it is found in sufficient concentrations in the diet. Having enough magnesium is very important for quality of sleep, insulin sensitivity, and stress management. All three of which are key factors for creating and maintaining a healthy and lean body. Ultra Crown offers a variety of forms of magnesium supplements. Using a variety of the chelated forms of magnesium, such as magnesium glycinate, magnesium orotate, magnesium fumerate, and magnesium taurate, is your best bet in restoring your magnesium levels quickly. However, I would advise against using magnesium oxide because it is poorly absorbed by the body and is commonly found in low quality supplements. Those who are deficient may need up to 1g of magnesium a day. If you are curious about your magnesium levels, I recommend asking your doctor to test for your red blood cell magnesium levels (not serum magnesium). Carnitine is an essential nutrient for fat metabolism and overall energy levels. Without enough carnitine, your body is not able to efficiently use the fat stored in your body for fuel. Carnitine has also been shown to increase insulin sensitivity, especially when taken with carbohydrates. Because carnitine is found in the highest concentrations in meat, along with the L Arginin supplements it is especially useful for vegans and vegetarians to supplement with carnitine to obtain sufficient amounts of this valuable nutrient. 2-6g of carnitine is a potent dose for fat loss purposes, with the higher dose being indicated for those with higher a body fat percentage and more significant insulin resistance issues. Carnitine is synergistic when taken with a fish oil supplement. Try Eiyo Nutrition – Natural Nutritional Supplements , USA Manufactured which contain a blend of lipolytic, proteolytic, and carbohydrolytic enzymes to assist with the digestion of protein, fat and carbohydrates. 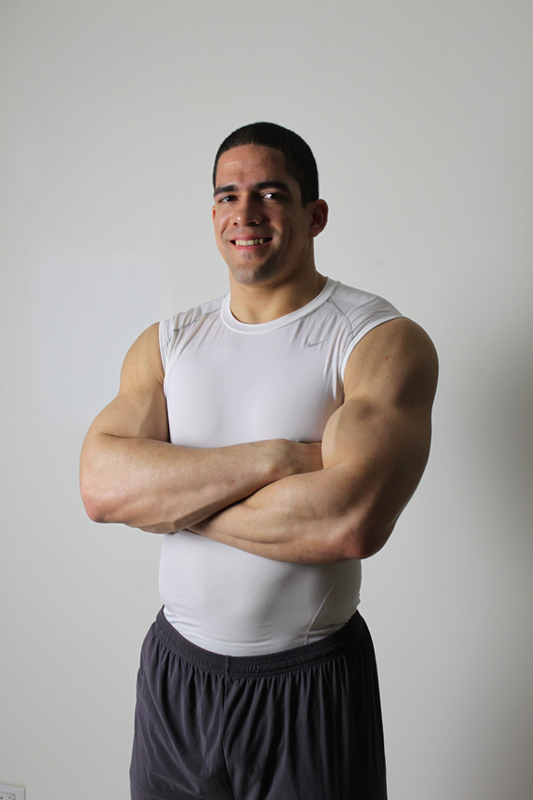 Javier Garza is a personal trainer, nutritionist, and competitive weightlifter based in Jersey City and New York City. He runs the website www.strongtimes.com as a resource for training enthusiasts and health conscious people around the world.